You are here: Home / Featured / snowflake? Here’s one for those who appreciate the beauty of cellular organisation in the microbial world. 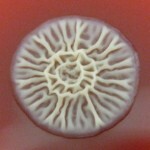 No need to tell you what microbe this is – if you need to know, you’ll have recognised it already. If you don’t know its name, never mind. Just appreciate the fractal geometry.